This post is a twofer – it’s a Friday Favorite (one of my favorite recipes) and a Vegan Staple (an example of how to spice up a fallback vegan food item). This recipe is doing double duty! The concept is simple – you just blend a ripe avocado with lemon juice, garlic, olive oil, basil, and salt and toss the resulting sauce with your favorite noodles. Avocado blends like a dream, creating a luscious sauce that perfectly clings to your noodles. The result is a creamy, rich, and incredibly satisfying dish. The beauty of this dish is that it’s incredibly versatile – don’t like lots of garlic? Use a single clove! Don’t have fresh basil? Omit it! And you can use any type of noodles – on this occasion, S picked up some locally made black olive and garlic fettuccini, which lent the dish a little extra flavor. Spaghetti or even soba noodles are fine choices, too. Although we usually eat this dish alone – it’s deceptively filling! – it’d be fantastic with a slice of fresh crusty bread or a simple side salad. If you’re looking for a low-effort, high-rewards dish to add to your meal rotation, try this one – you can thank me later. What’s your quick weeknight meal of choice? Which OhSheGlows recipes are your favorites? Ooh yum! That looks so easy and delicious! My quickie meal for weeknights is a mashed potato bowl. You can really put whatever you want in there, but usually we do: mashed potato, some kind of dark and leafies, and fried tofu or a can of beans. And lots of nooch, of course! Oooh, that sounds amazing. I’m definitely going to get mashin’ next time I need a simple meal! 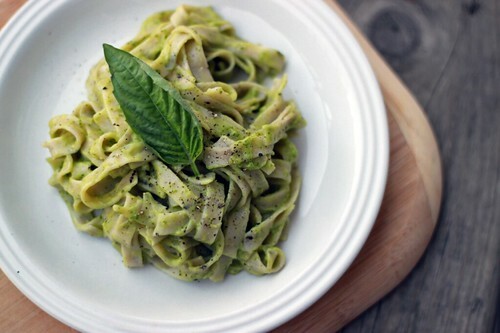 Avocado pasta is a favorite standby of mine too! Yours is so vibrant looking! It’s so simple and delicious; I can’t help but love it!